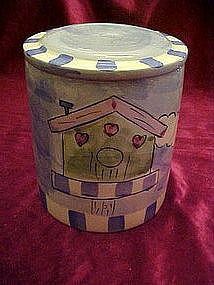 Another nice little hand painted treat jar by Cookie Keepers. Made of glazed ceramic. This one measures 6" tall and is hand painted with a cute birdhouse, a blue bird, and big yellow flower. Nice condition, no damages.